"Window to Paradise" by IKONICK. Wanderlust: (n.) a strong desire or urge to travel and explore the world. 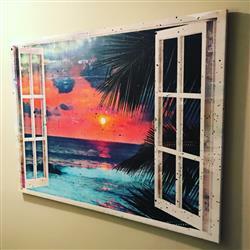 Let your world traveler out with this colorful beach style canvas print. Even our walls like the idea of a vacation. The art arrived promptly and was even more beautiful than it looked online. The colors really pull you into the scene. This is my 6th piece I’ve purchased from ikonick and I have not been disappointed! You won’t be either!